When you schedule a webinar, you can save the settings for that webinar as a template for scheduling future webinars. The template includes basic settings, such as whether to disable Q&A, as well as more advanced settings, such as the addition of poll questions and answers. For recurring webinars, you also have the option to save the recurrence schedule as part of the template. 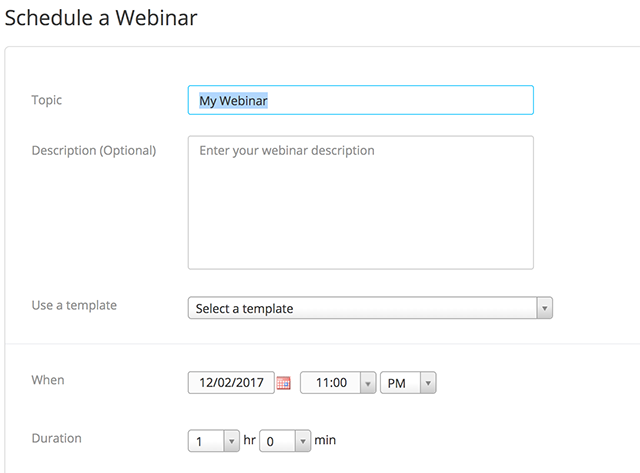 After you save a webinar as a template, you can select that template when you want to create a webinar with similar settings. You can select from up to 20 saved webinar templates. Log into Zoom and navigate to the My Webinars page. Choose any settings that you would like to apply to the template. Scroll down to the set of tabs for Invite Attendees, Email Settings, Branding, Polls, and Integration. Modify and save any of the settings you would like applied to your template. The following example shows that a poll has been added. Click Save this Webinar as a Template. Specify the Template Name, then click Save as Template. Choose a previously saved template from Use a template menu. Basic and advanced settings from the template are copied into the newly created webinar. Update the webinar name and description (if needed), and update the date/time information or recurrence information if you saved this in the template. Change any other settings, then click Save Webinar. Note: If you have saved one or more webinar templates, you can view or delete them from the Webinar Templates tab. You can save up to 20 different templates.